I know, I know. It’s another chile post. I can’t help myself. Right now, it’s chile season. The fresh chiles season has come to an end (I bought my last 10 lbs last week) and now you are seeing all of the beautifully, fresh, dried chiles. It’s just too much for a chilehead like myself to resist. This dish, however, is unlike any chile dish you have ever seen and it is sooooo goooood, to boot! You owe it to yourself to check it out. I know some of you are saying this isn’t a real chile relleno because it’s not battered and fried. Battered and fried rellenos, however, are just one of a myriad of relleno preparations. The truth is a chile relleno does not have to be battered or fried. A chile relleno is a stuffed chile, nothing more, nothing less. You have savory chile rellenos stuffed with cheese, seafood, chicken, pork or beef (Here are a couple of non-battered and non-fried savory relleno recipes on the blog, Cinco de Mayo Rellenos de Camarones and Stuffed Roasted Red Chile a la Richard). There are also dessert rellenos. 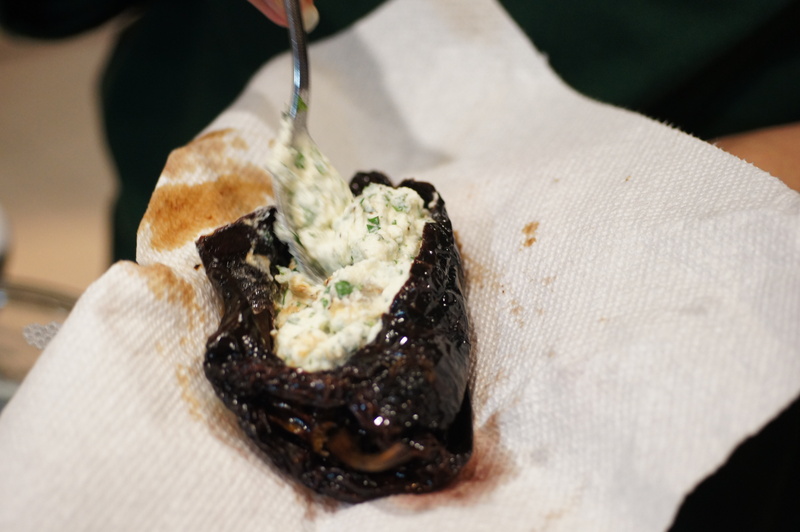 There is a forthcoming post on dessert chile relleno in the works somewhere. 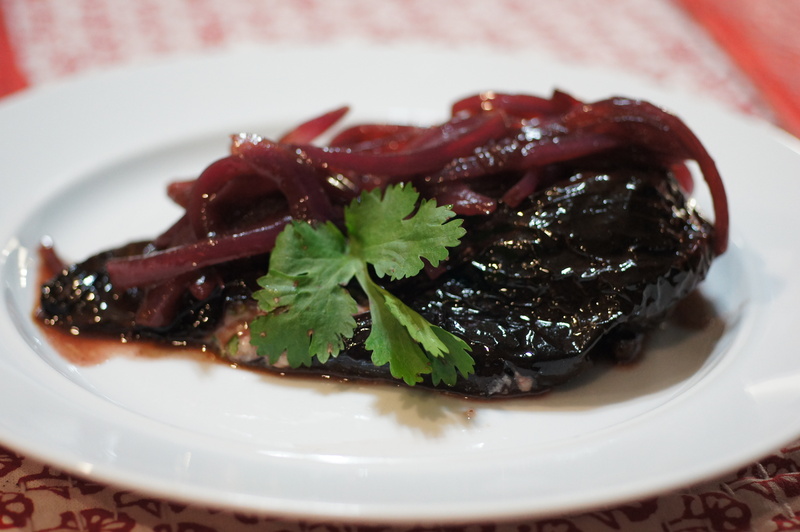 This is a sweet and savory appetizer chile relleno in a red wine escabeche sauce that will absolutely blow your mind. I previously posted on escabeche in the post Swordfish in Sriracha Escabeche Sauce, how it originated in Persia and spread throughout the world. Swordfish in Sriracha Escabeche Sauce is more of a Philippine escabeche with the ginger and tomatoes. 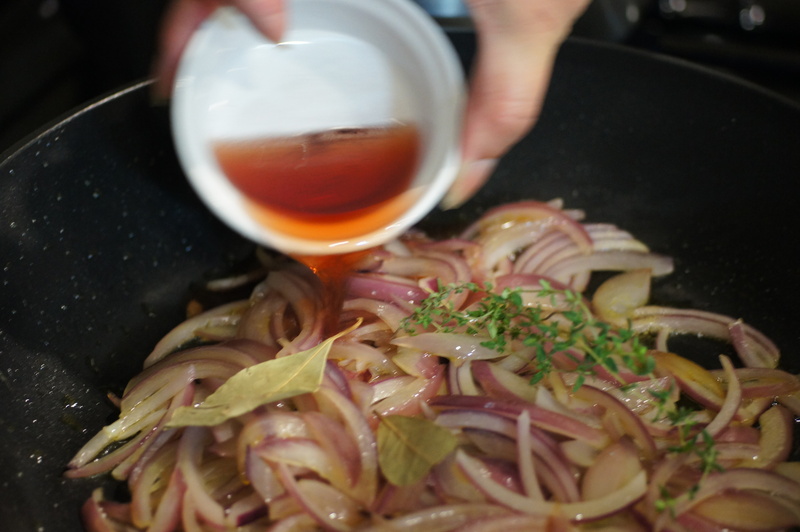 This post is a Mexican escabeche. It’s not uncommon to find these types of rellenos in Mexico. You will find it in Baja and Mexico City, among other places. You just don’t find it in the US very often, although there is a restaurant in Austin, Texas serving Chile Ancho Rellenos en Escabeche but they are using chicken, as opposed to cheese. 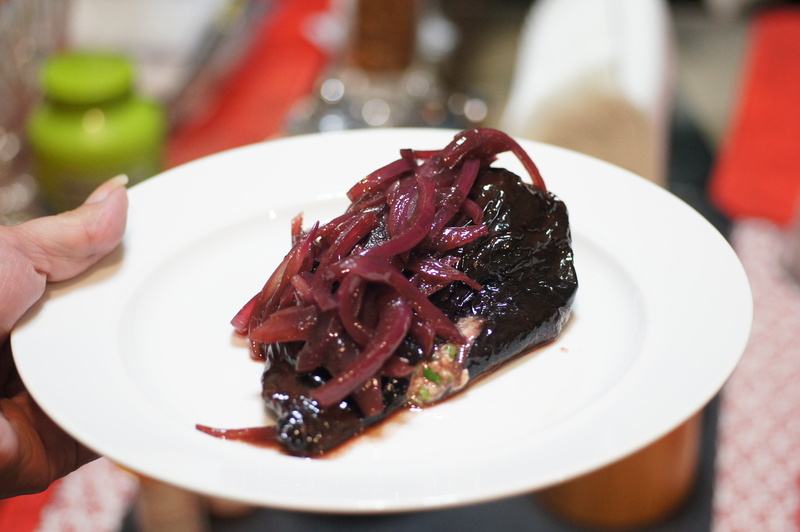 This is a Rick Bayless dish off Season 8 of his television show, Mexico–One Plate at a Time. When we saw it we had to try it because it sounded and looked so good. 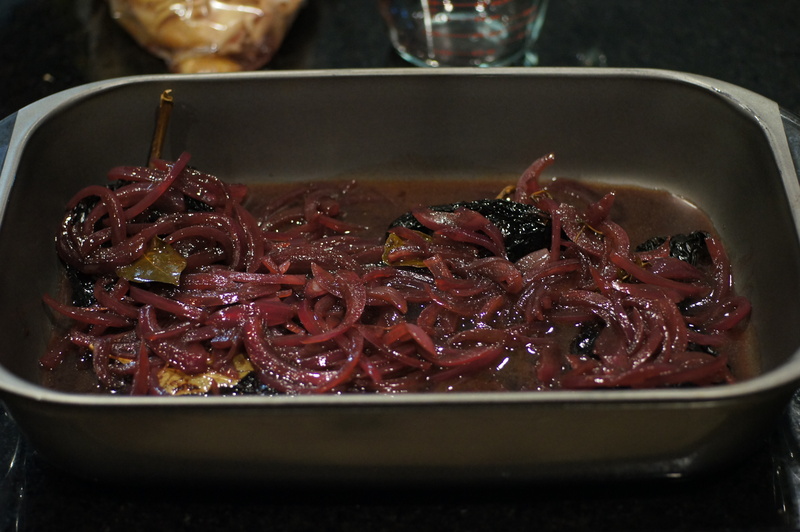 I had recently purchased some beautiful ancho chiles and was wanting to make rellenos with them so the timing of the episode could not have worked better. We modified the recipe, however, because we didn’t want 8 chile rellenos now that Knothead and Quickstep are gone. Also, we omitted the piloncillo and used honey instead. The resulting dish was as good as it looked. It’s sweet, savory, tart, tangy and creamy with flavors of dark fruits, hints of chocolate and no heat. It’s a very sophisticated dish yet simple to prepare. So if you feel like trying a traditional Mexican relleno with a different twist that’s not fried and battered, give this a try. 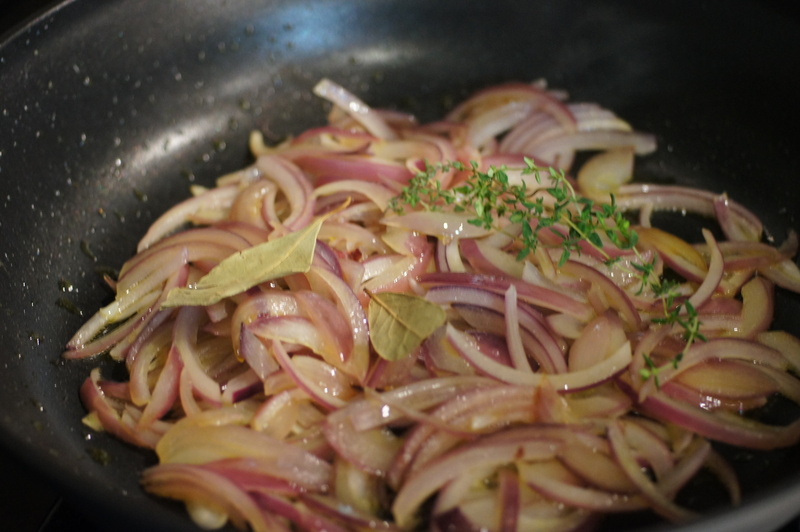 Prepare the escabeche. 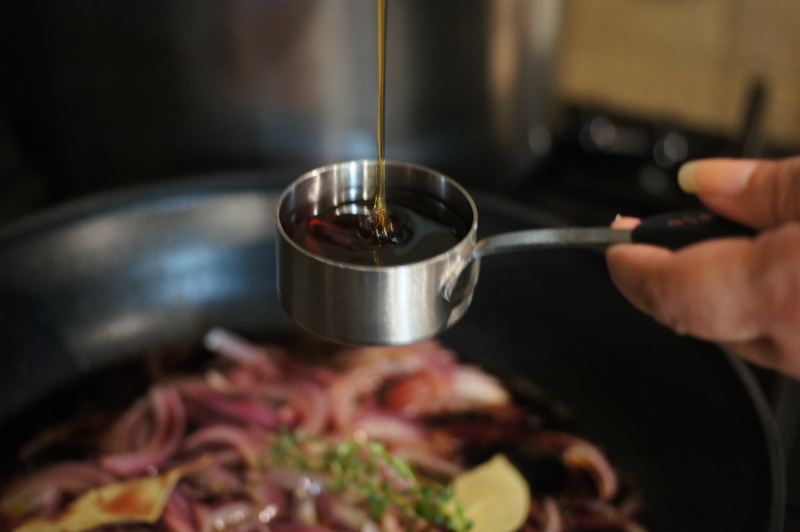 In a large (10-inch) skillet, heat the the olive oil over medium-high. 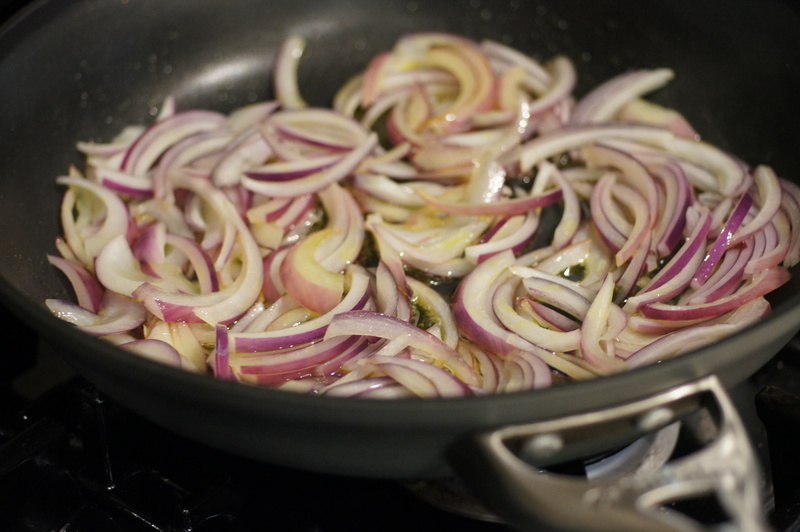 Add the onion and cook, stirring regularly, until beginning to brown but not too soft, about 5 minutes. 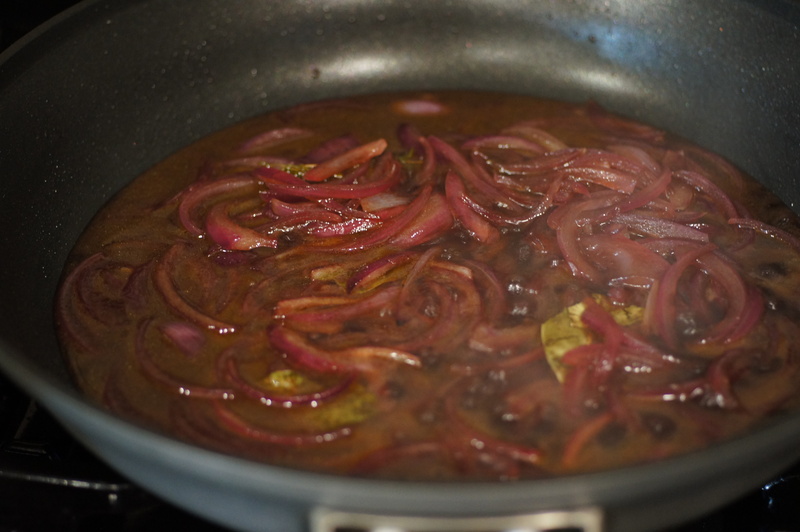 Simmer over medium-low for 15 – 20 minutes, then remove from the heat. Prepare the chiles. Use a small knife and carefully cut a slit in each chile from stem end to point. Remove the seeds with knife or fingers. 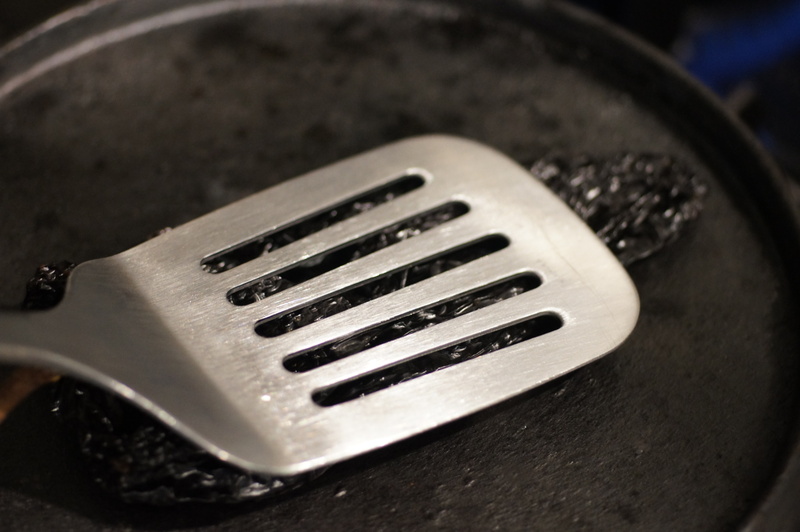 by pressing them against the hot surface with a metal spatula for a few seconds, then flipping them and pressing the other side. 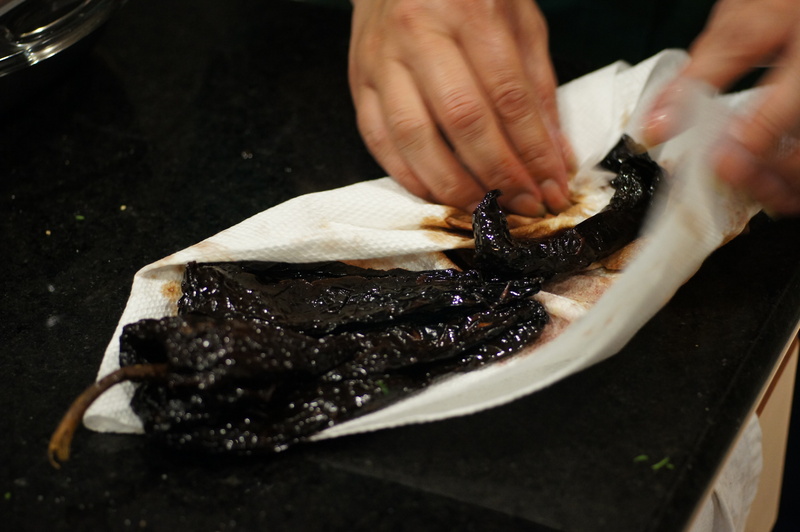 DO NOT BURN THE CHILES. They will not change color—just fill the kitchen with their roasted chile aroma. 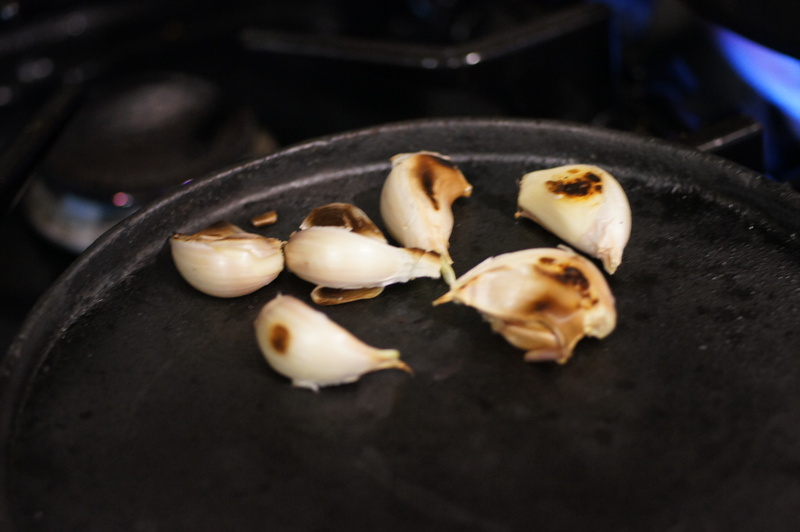 While you are toasting the chiles, you might as well toast the garlic by laying it on top of the comal as well. 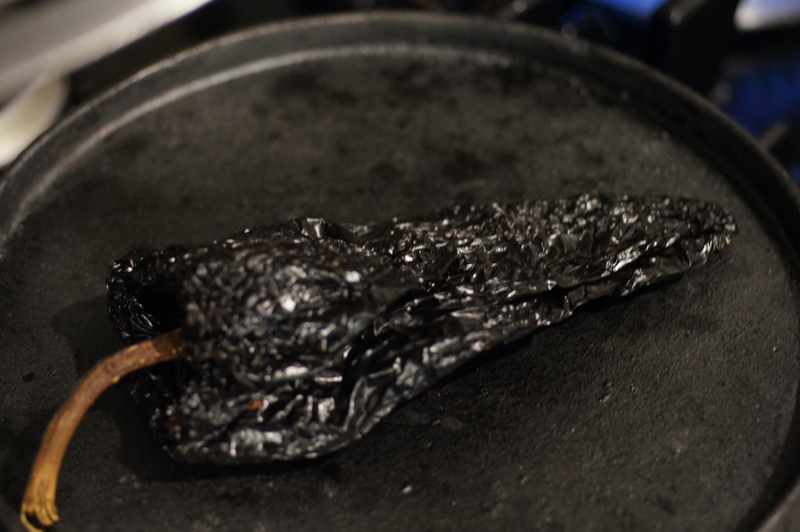 Be very careful not to burn the garlic. Keep an eye on it and turn it as needed. You want it soft and toasty, roughly 15 minutes. 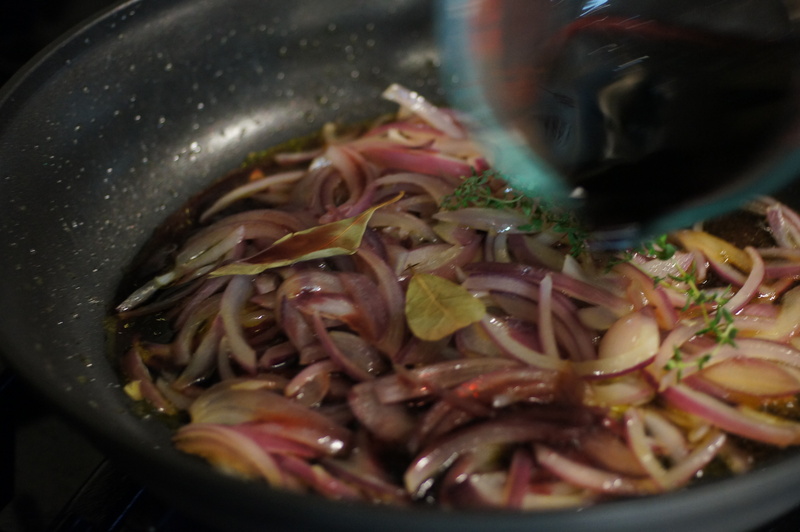 Place the toasted chiles in a baking dish and cover with the escabeche. Weight them with a plate to keep them submerged and rehydrate for 30 minutes. 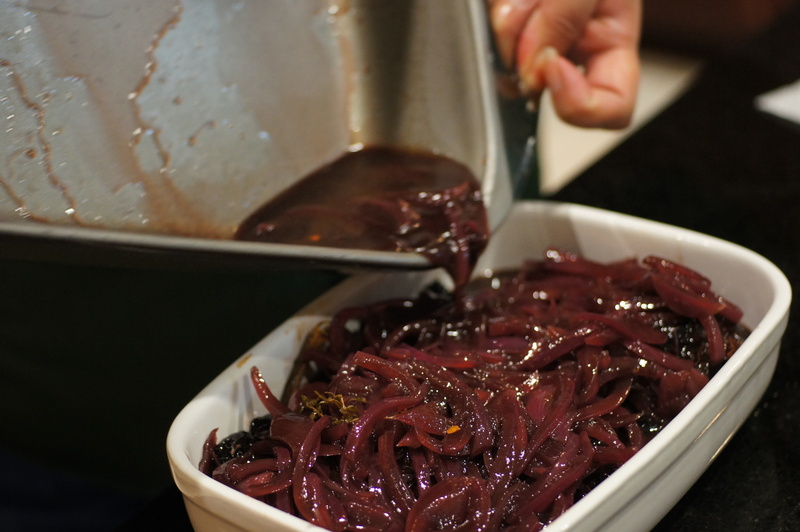 After 30 minutes, carefully remove them from the escabeche and lay on a plate. Pat them inside and out with paper towels. 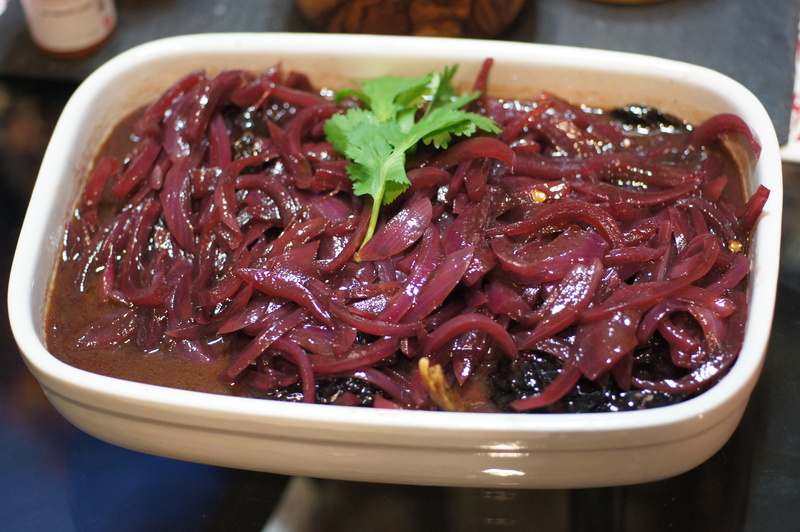 Set aside the escabeche for serving. Prepare the filling. Cool, peel and mash the toasted garlic with a fork in a medium bowl. You want a coarse puree. 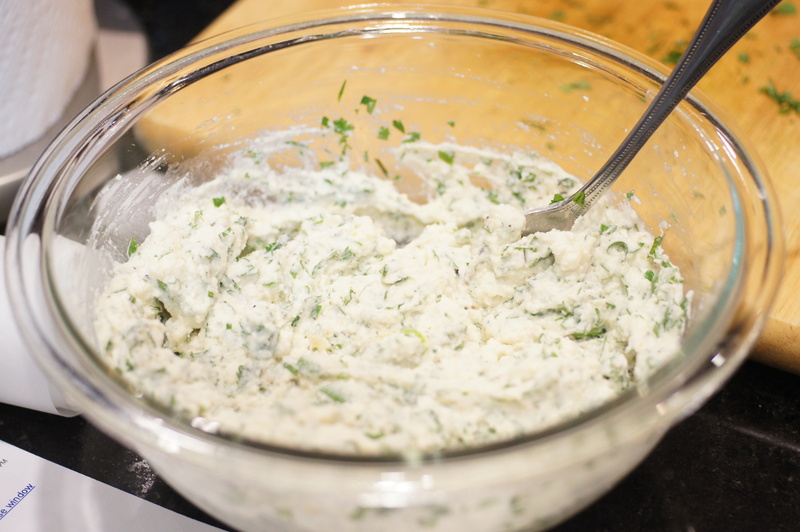 Add the ricotta, cilantro 1/2 tsp sea salt and black pepper. Mix together. Taste and adjust seasoning. Lay on a deep platter, seam-side down. We don’t get anything like these here in Ireland. They look really interesting. I imagine they taste pretty awesome too. This sounds different and delicious, Richard. Great job! Thanks, Karen. It definitely is different. I liked it a lot but Baby Lady didn’t care for it that much. I love chile relleno, and I have only had the battered and fried version. I had no idea they could be so much more versatile and don’t have to be fried. I think I need to find myself some peppers. I really admire the thought and preparation behind this beautiful dish. The 10lbs of chillies gets my heart racing, I don’t know that we utilise those Ancho chillies here in Australia (perhaps due to lack of variety, or because most chillies tend to be long and thin, or little and hot, hot, hot!) regardless, yours is a beautiful dish! I was also very I retested to know how you made the ricotta! I’d love to see a recipe (if you don’t already have one on your blog?) it’s something I’ve wanted to try for a while now. I’m sure there’s a few methods kicking about but I’m always keen for more knowledge! Thanks, Alice. 🙂 I’m glad Rick Bayless thought about this because I was duly impressed enough to make it. There is a lot going on in this dish. I have a ricotta recipe but it’s not posted on the blog. My food buddy, ChgoJohn, over at http://fromthebartolinikitchens.com is the cheese wizard. 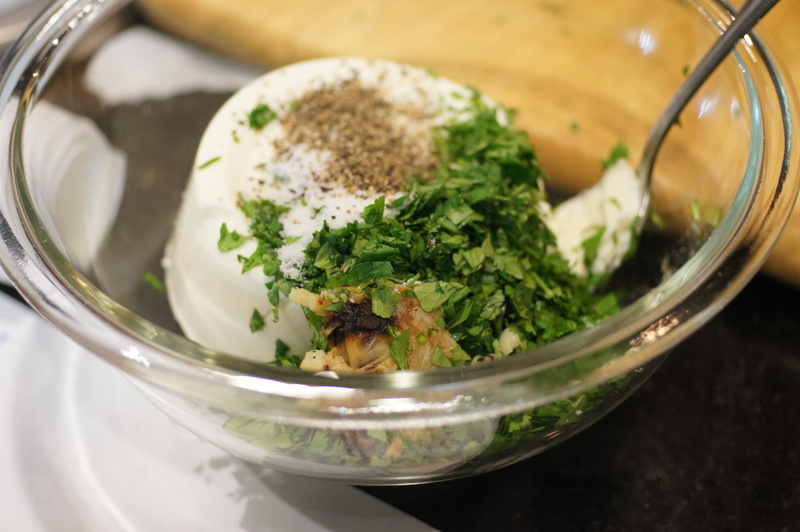 He has all sorts of cheese recipes, including one for ricotta. Ricotta is truly a simple cheese. The trick is to leave it alone despite all of the temptations to stir it or check it. I foound this out from experience. 😮 Failure is a wonderful teacher. Oh My God. 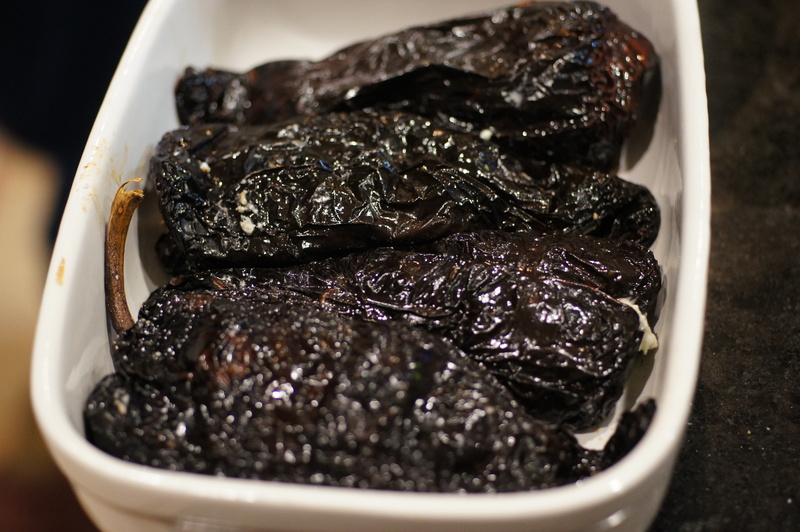 I’ve never seen dried chiles stuffed – what an amazing recipe! Thanks for telling me!!! If you like rellenos, check back later today because I will be posting Chile Relleno en Nogada (Stuffed Chile in Walnut Sauce), a classic Mexican holiday relleno. Oh my god again. I cannot wait!! !